Well, it’s finally stabilized. Its a cross stitched whole cloth. Many people don’t realize that the cross stitch kits are actually supposed to be layered before the cross stitching is done. The stitching is supposed to make a reversible quilt. The stitching is supposed to be the quilting too. The faint lines of the background design are supposed to be running stitches. Down at one dot, back up at the next. In all my years as a professional machine quilter, I’ve never seen a cross stitch quilt done properly. I went around all the flowers with clear thread and now I plan to follow the markings to do the background with white thread. I won’t be finishing this one this weekend. I plan to go through more things to get ready for the yard sale. I may not get a chance to post over the weekend. It will depend on whether I get a lot done or not. WE are SO much alike. I don't even have to search the net. After watching the news,, these things just POP into my head. WE had a “flint slasher”.. and the first victim was within WALKING distance from our house. WHEW. scarey stuff. If you actually read the directions that come with the kits, you are wrong. They are not to be layered before cross stitching, per their directions. I'm one of those that didn't know about layering before cross stitching. It makes sense now and I've been cross stitching for years but never saw any right or wrong way to do it right. Always learn something new from you! Thanks!!! Seems like the cross stitch quilt with a solid (non-cross-stitch) backing would be easier to live with– wouldn't snag on stuff. If I made one, I'd probably do it this way. I know what you mean about not needing any extra scary stuff. Especially after the fires in Detroit and San Bruno due to our aging utilities. The same thing could happen anywhere. 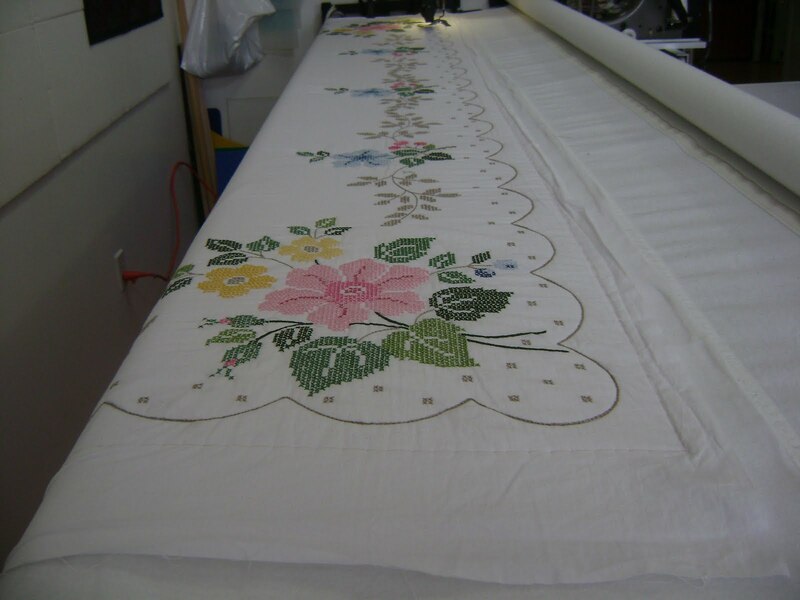 This entry was posted on September 10, 2010 by Anita in Customer quilts 2010, QUILTS - CUSTOMER.